Craft a Scene: Final Week - Let Your Light Shine! It is the last week of our "Let Your Light Shine" challenge. 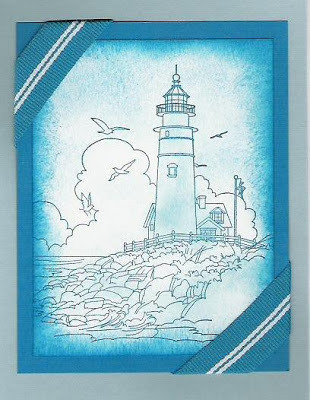 You still have time to get your project in for the random draw for a lighthouse stamp from Art Impressions. I have two more email entries to include in the challenge. The first one is from Mel. Lovely job Mel! The second is another card from our friend Margaret in Yorkshire. Margaret from Yorkshire here again. 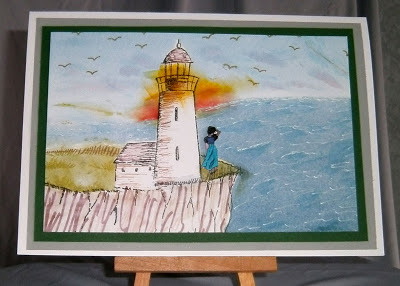 This challenge has proved more difficult – however having only just bought Lindsay Mason’s Cliff Top Scene set of stamps, I couldn't let the challenge pass me by. 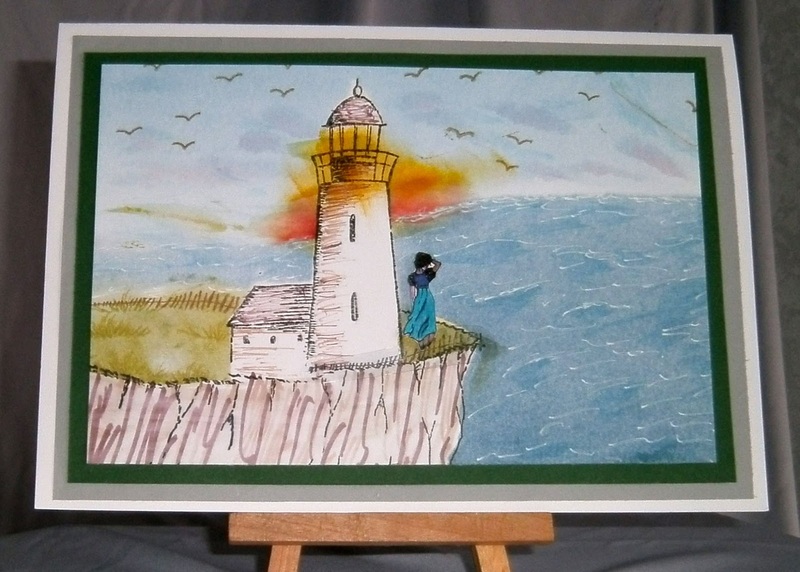 The inspiration for the card came from a very old song, sung by Conrad Veidt, called Where the Lighthouse Shines Across the Bay. (Anyone who used to listen to Terry Wogan on BBC Radio 2 may well remember him playing this song on a regular basis, albeit a bit scratchy). I have named my card Come Home my Love which is a line from the song. 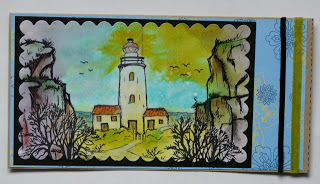 From Lindsay Mason Cliff top Scene set: Cliff top, Lighthouse, Seagulls, Fence, Grass. I used a selection of Adirondack and Tim Holtz Distress Inks for the brayering and a White Gel pen to add the foam of the waves. The girl was stamped onto White shrink plastic and coloured before shrinking. As originally stamped, she stands almost as tall as the Lighthouse! The finishing touch was the fence stamped onto acetate and attached to the card to ground the girl. We also have two beautiful lighthouse creations from the design team to share with you this week. 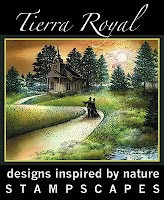 really nice stamps are used.